I’m taking a second day in a row off from skiing, because there’s been no new snow and the weekend crowds are here—such as they are, which is not very crowded at all, but my standards have changed now that I’ve been spoiled by not having to wait in lift lines hardly at all ever around here—plus I’m tired from being out late last night for one of my periodic forays down to the Spokane area to hang out with friends I’ve found there thanks to going to classes and meetups and such. So now instead of skiing, I’m sitting here typing while waiting for a load of laundry to finish in the washer. 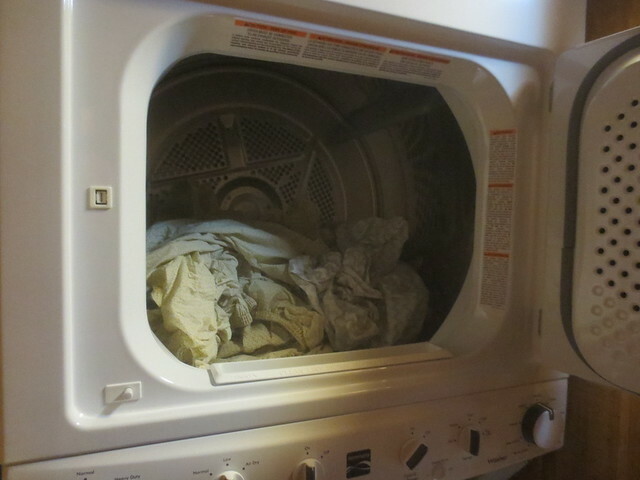 Then the exciting part will happen: I’ll go downstairs and put the entire load of laundry into the dryer, all at once. I realize that probably doesn’t sound all that exciting to those of you reading. But those of you reading most likely have not had the experience of doing laundry with a charming wee dryer that holds approximately two bath towels at one time. Said charming wee dryer came with our condo when we bought it. It held about a third to a half as much as the washer that also came with the condo (that was of similar 1970s vintage but from a different line). I’m sure it was fine for the families who owned the place before we did and could just take most of their laundry home to Spokane after spending weekends up here. And it was fine, if somewhat annoying, for us for a while, too. Twice the blower belt broke and we used jumbo rubber bands as stand-ins until we could get replacements; once the drive belt broke and we just had to wait until the new one came. Sure, we talked about getting a new dryer, but because of the configuration of the space the laundry machines are in, we couldn’t get just a new dryer but would have to also get a new washer, too, and some electrical work because the wee dryer ran off a 120V outlet. So we got new dryer belts when needed, and I grumbled periodically about how long it took to go from dirty clothes to clean, dry clothes. This past summer the door switch in the dryer broke, which was okay. If I really wanted it to stop, I could just turn the timer dial to zero. So we were making do with that situation when the washer got in on the game. I put a load in and realized a couple hours later that it was still agitating on the first part of the cycle. That’s not right. I found I could advance the timer by hand and force it through the whole cycle, as the water filling and draining still worked when the appropriate phases were reached, but that meant setting a timer two or three times a load depending on the cycle and interrupting whatever else I was doing to mind the washer. It was at least easy to see what it was doing, as the lid lock had long since stopped working so I could just lift it up and peek in to verify it was spinning or whatever. I did do some research on what it might take to fix the washer, but after some discussion Mr. Karen and I decided the time had come to replace both machines. First step in that process was research, which Mr. K took on. He found that for the width of the space we had, there were only three options with a top load washer that fit (I didn’t want a front loader, as leaving the door open to let it dry out would mean blocking access to the bathroom), and two of those were identical but for the brand name. We went to look at floor models (one was here in town but the other was down in Couer d’Alene, an hour plus away). I liked one better; Mr. K made measurements of it that he hadn’t been able to find online to make sure it would work with our space, and then the real fun began. Several months, many hundreds of dollars, and some rope-and-pulley-assisted manual labor later we had rerouted water lines, a new gas line pulled from the garage (we already had gas to the house for the fireplace and decided to go with a gas dryer this time), a visit from the county building inspector, and a shiny laundry center that washed things without supervision and dried them in less than an entire afternoon. I am sincerely hoping these machines will still be working when the next family moves in after we sell. In the meantime, I am so enjoying doing things like drying a whole set of king sheets in one shot, rather than having to do the flat sheet and fitted sheet in separate loads. Ah, luxury.